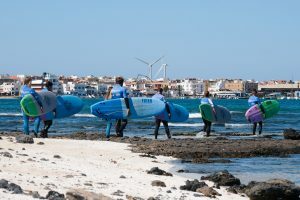 Our surf school is the heart of our camps, in this case our Surf School Fuerteventura. Since we are little surfing has always belonged to our lives and it is still an essential part. This passion we really wanted to make to our job with that we have founded our first surfcamp a few ages ago. Through our experience and the study of different training methods we developed our own schooling concept with that we are successfully teaching since many years. The fun factor is also an important part for us, because Surfing is more than just a sport: the point is also to make new friends and to internalize the fascination of surfing. It is very important for us to pass on the lifestyle of surfing and everything that comes along with it, because we grew up at the ocean and we have always been connected with this kind of sport. 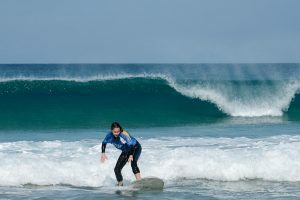 With that the philosophy of our lessons in the Surf School Fuerteventura is to put the main emphasis on the practical experience even if a certain part of theory is necessary. It is important for us that you have a lot of fun during the lessons and that you reach learning progress really fast. With that the theory lessons are not only about surf-know-how but also about rules in the water and about the respect towards other surfers and the ocean. 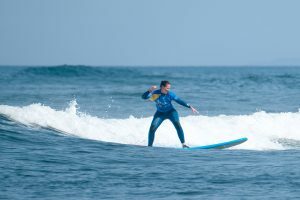 The right technique for the position on the board is very important that you are able to surf green waves soon. Our licensed surf instructors attach big value on showing you the right steps to do the perfect take-off. So we relinquish for example the (useless) staging post to stand up with the knees first. This is not only wrong but it also takes longer till you get the right position on the surfboard and it can lead to a wrong body position where you lose your balance very easy. So our motto is: do it right from the very beginning! All our surf teachers not only have official and recognized licenses (FES/DWV/ISA/BSA/FCS) but they are also trained life guards. It is normal for us to give you the necessary security in the water but unfortunately, this criterion is not given in every surf school. In the surf schools of Planet Surfcamps we offer the perfect all round package of learn to surf, fun in the water, theory and the necessary security!